With each passing week as the League of Ireland takes shape Galway United’s efficient start to the season gathers significance. Putting points on the board early and often is an intelligent policy, United have another chance tomorrow evening (7.45pm ) when they host Bray Wanderers in Terryland. When leaving Oriel Park following a drab clash with Dundalk last Friday, Ian Foster could cling to the fact that his team headed the locals in the standings. Dundalk celebrated their 1- 0 win with surprising zeal, and Foster offered a crisp appraisal of Galway’s failure to summon the required dynamism. “The minimum requirement in this game is hard work, and if you don’t work hard, you don’t deserve to get anything out of the game. “We just weren’t at it tonight, for whatever reason I really can’t put my finger on it at the moment. We didn’t start the game well. We didn’t press high enough up the pitch. We didn’t close down well. The players have been excellent this season, but they were just way off where they can play. With Derek O’Brien suspended, Foster will be forced into a change tomorrow, and it will be interesting to see what the Galway manager opts for. The blistering Shane Fitzgerald suffered an injury in the warm-up at Oriel, and would be an ideal replacement if deemed sufficiently fit to start. Jay O’Shea may return to a withdrawn attacking role, but Declan Edwards could be afforded a first top-flight start also so Foster is not without options. Since the outset of the season Bray have proven to be rugged opponents, and their stirring win over Shamrock Rovers at the Tallaght Stadium a fortnight ago suggests they have potential. Eddie Gormley is moulding a bright young outfit, and the skill of Gary McCabe and Jake Kelly caused Galway bother at the Carlisle Grounds back in March. Galway will be striving for the full complement tomorrow, and a victory is within their remit providing the attitude and application is of the high level sought by Foster. •Galway United will hold a fans’ forum this evening, Thursday May 14, upstairs in Fibber Magees, Eyre Square (6.30pm ). All Galway United supporters asked to attend. Application forms for the patron scheme will be available. GUST will be running a bus to the premier division match against Sligo Rovers at the Showgrounds on Saturday May 23. Seats can be booked by ringing Ronan Coleman 087-6972823, or Conor Holland 087-2184132. This week’s Galway United Lotto draw will be held at half-time at the League Cup quarter-final v UCD (Monday May 18, Terryland Park, 7.45pm ), for a jackpot of €5,000. 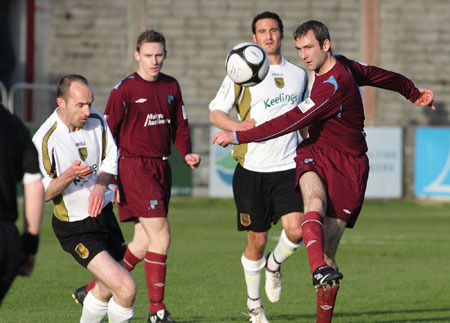 Mervue United staged a remarkable late rally to plunder a draw against an expensively assembled Sporting Fingal, and Johnny Glynn will be hoping for similar industry at Ferrycarrig against Wexford Youths. Kevin Barrett, formerly of Colemanstown United, tucked away a last-gasp finish to deny the promotion chasers, and Glynn was thrilled. “It’s great to score a goal in the last minute. We’ve scored a very, very important goal and I think we deserved it for the amount of work we put in and the possession we had. Having been on the receiving end of cruel concessions at Terryland Park against Finn Harps, Shelbourne, and UCD, Mervue were encouraged that it was they who landed the blow when Fingal were in town. Wexford Youths away is another tough test, and Mervue will be eager to make another statement of intent in the south east.